Niche line Bond no. 9 will launch B9, a new unisex fragrance inspired by the brand's flagship store on 9 Bond Street in New York City. The notes include saffron, gardenia leaves, amber and musk. Bond no. 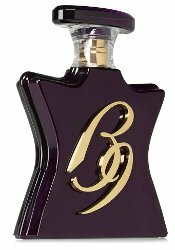 9 B9 will be available in 50 ($260) and 100 ($320) ml Eau de Parfum. Look for it in August. I said ‘B9’ out loud and it sounded like ‘benign’. Probably one to avoid on that basis. My thoughts exactly. Don’t think they thought that one through. Seriously doubt it will be a problem for them. The bottle looks very Estee Lauder to me. I’m DEAD! That Bottle is EXQUISITE! And Loving the sound of the notes… Saffron is always good! This will be an Eventual buy! The notes sound good but the execution of it may be a chemical spill as I find most of the Bond No. 9 perfumes. Did I read that right? Gardenia leaves? I don’t believe that I would be able to discern a gardenia leaf from any other leaf. I will, however, be trying this, I mean…that bottle!